After a few of these you'll be howling at the moon too. We’re technically “on” the wagon, but we’ve enjoyed a few recent lapses. There have been the occasional cold cocktails we’ve sipped in the evening, in spite of earlier pledges to go sans booze “tonight”. On Saturday, the day of the Super Moon, the Earth’s celestial companion had a strange effect on our psyches. We ate lightly throughout the day, we cleaned and inventoried the pantry and our plan for the evening was to enjoy a little tea and some chocolate chip cookies while watching Weeds. In other words, the usual. Alas, we got a little thirsty for something shaken and gave in to our martini craving. Maybe it was the gravitational tug of Saturday’s Super Moon or, more likely, our recent lapses that made us give in to our liquor cabinet. 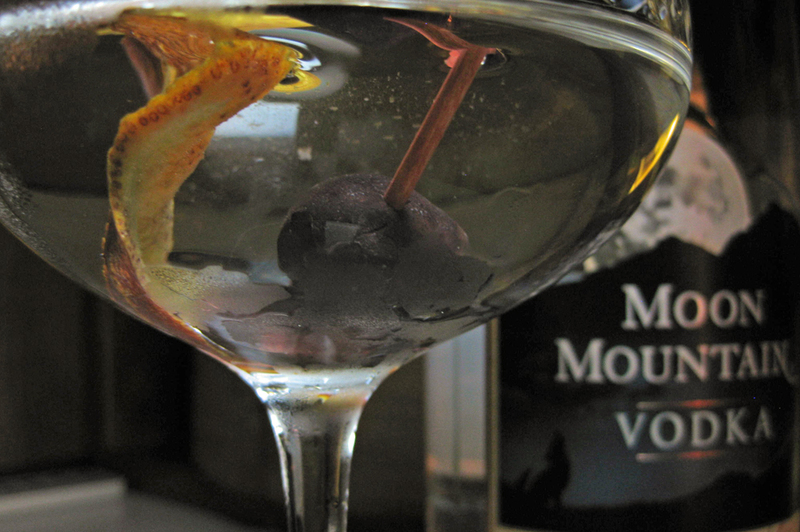 Being short on gin, we used equal parts gin and vodka (Mountain Moon Vodka, perfect for the night), shaken, and instead of the traditional green olive or lemon twist we garnished with a kalamata olive and blood orange zest. This twist on a martini recipe takes inspiration from the super perigee moon and one of our favorite cool weather flavor combinations – orange and olive. We won’t wait for the next Super Moon before we have another one of these thirst quenching martinis, but it will be another few weeks at least before we take another sip of anything quite so boozy. After all, we’re still on the wagon. Add ice cubes to cocktail shaker, add booze, shake like hell, pour into chilled glass and garnish with blood orange peel and kalamata olives. the ‘shake like hell’ part is the essential element of any good martini recipe, but have been experimenting with the gin and blood orange combo for awhile now and find it quite tasty. this looks great.